The tasting was held in Edinburgh at Peckham’s Underground restaurant. I sat with Jean throughout the tasting and subsequent dinner and found him to be a highly entertaining character. Charming in the extreme, he has a mischevious sense of humour and a terrific passion for the wines of Alsace (and Trimbach in particular of course). With each tasting throughout the evening he would leap to his feet proclaiming I love this wine!” or “This is my favourite!”The wines of Trimbach are made in a very classical mould: dry and relatively restrained in style. 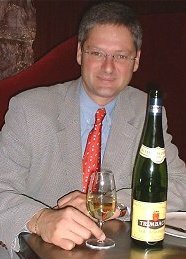 Jean confessed that he was disturbed by the move towards more and more residual sugar in some Alsace houses. These wines have a flattering profile of sweetness and richness, but Jean thinks that some houses have gone too far, turning a dry and food-friendly style into semi-dessert wines. Trimbach’s avowed intention is to make balanced wines built for ageing, whilst still ripe and fruit-driven. He wants his wines to express something of their terroir. The average age of Trimbach’s vines is 35 to 40 years, and they are planted on some of the prime sites of Alsace, including top Grands Cru vineyards like Osterberg and Geisberg. Like the house of Hugel, Trimbach do not use the name of the Grands Cru (demarcated only in the 1970’s) on their top wines, believing that the wines they have always made from these slopes speak from themselves. They farm not organically, but with minimum use of fertilisers and herbicides. One intiguing practice in use is Confusion Sexuelle, an environmentally safe system for controlling insect damage via the disruption of mating patterns. These are mostly Trimbach’s basic bottlings. To sum them up, I would say they are extremely good, correct, and delicious, though they don’t scale the heights the way Trimbach’s top wines can. Meanwhile, these remain fine and utterly reliable wines. Pungent, crunchy fruit on the nose, packed with melon and quince, grape and floral notes. The palate is rich and full-bodied with very powerful fruit and a touch of residual sugar, finishes long with soft acidity. Delicious though perhaps a touch over-powering? This has just the beginnings of a waxy, petrolly character on the nose beneath a mass of lime fruit and a pure white core of apple. The palate to has shimmering citrus fruit, but there’s a ripeness here that almost suggests pineapple. Very good acidity and balance, a ripe style yeet still restrained and keen. Floral notes and peachy fruit. Quite straightforward. There is an unctuous fullness on the palate with a little nettly leafiness and plenty of nectarine fruit and citrussy acidity giving balance. Good, though not terribly complex. Wonderfully smoky nose with nuances of gingerbread and luscious fruit. Quite a sweet impression as it strikes the palate with flashy tropical fruit flavours before a grapefruity acidity drys the finish elegantly. Good length. Juicy and enjoyable. Again a wonderful sweet impression from ripe fruit with pear, melon and apple, a little suggestion of herbaceousness, then rich, buttery overtones towards tropical, syrupy notes. Fat in the mouth too, with unctuous, ripe white fruits, suggestions of guava and flowers, a little note of honey. Quite long, this is pure and lovely stuff with plenty of excitement. This has lovely complexity on the nose with a leafy, waxy quality and delicate spice and lychee notes, but restrained and tempered by citrus and floral notes. Still powerful on the palate, with grapefruit and plenty of acidity cutting through, this has good length and still pretty good balance, though I thought the fruit was starting to wane. Jean says it has 5 years at its presently enjoyable plateau.